An interactive map of jazz-era New York packs the sights and sounds of neighborhoods new and old, from Chinatown to Harlem. A typical wander through New York’s Upper West Side in 1929 would have left the pedestrian virtually deaf, assailed by the blasts of street construction and traffic horns. Having managed to escape these with their hearing intact, the aural assault was pretty endless: booming radios, metal-clanging garbage collectors, noisy boys, quarreling neighbors, and, yes, howling cats. These decibel heights weren’t limited to the stretch between 75th and 86th Streets, however. A casual glance at The Roaring Twenties reveals just how loud New York life was at the peak of the vociferous decade. Compiled by Princeton sound historian Emily Thompson, the interactive map plots 600 noise complaints logged by the city between 1926 and 1933 onto a sepia-tinged, cartographic representation of New York (based on a 1933 map Thompson found on Ebay). Should you want to hear for yourself, some of the coordinates are synced with audio-visual samples of the period. The sounds were sourced from the city’s municipal archives. 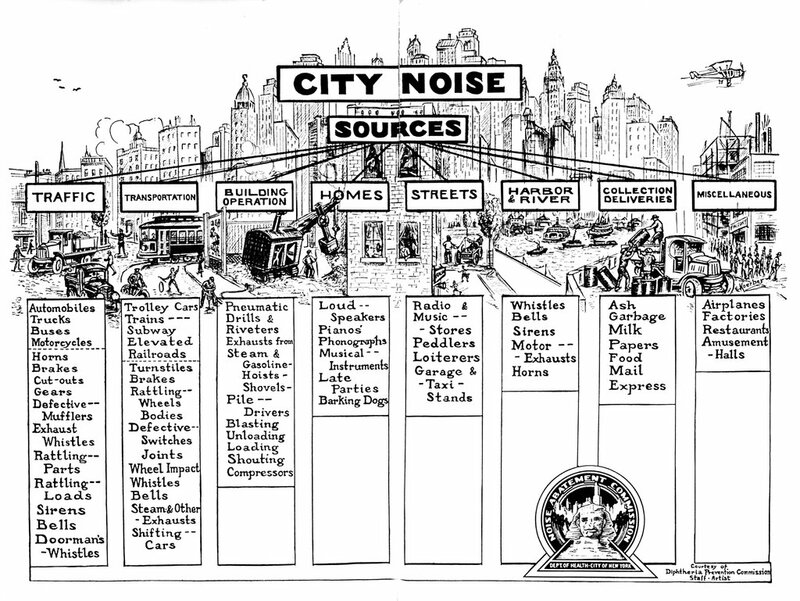 The ghostly audio material, a catalog of noise complaints, went unused for years, even after Thompson published her first book, The Soundscape of Modernity: Architectural Acoustics and the Culture of Listening in America, 1900-1933, which included a chapter on the sounds of early 20th-century urban America. Thompson had initially wanted to append a map of the complaints to this section, but she ended up passing, given the limitations of the page. It wasn’t until recently that Thompson was able to find a suitable platform to display her decades-old archive. “With a digital map…with pan and zoom features, the map became not only practical, but also beautiful,” she tells Co.Design. Working with Scott Mahoney, a web designer for Vectors, the team developed a map studded with clickable icons that, when activated, produce either a scanned reproduction of a noise complaint or vintage Fox Movietone newsreel footage of interwar New York, complete with garbled sound. Thompson had only discovered the videos, held at the Moving Image Research Collections of the Libraries of the University of South Carolina, after the release of her book. It took Thompson and Mahoney three years to complete the map that’s now a portal into a history only known to most through period dramas. “My intention is not simply to document what people heard, but also how they listened,” Thompson says. The sampled sounds speak of a populace trying to recalibrate its senses to the pace and sound of modern life. Radio technologies offered democratic pleasures of music and entertainment, with loud speakers, installed along “Radio Row” and elsewhere, filling streets with the sounds of jazz standards. Movies and newsreels had begun to introduce a sense of histrionics in the everyday, as evidenced by a short clip of two urchins playing out a PA about sanitation in leading-man prosody. New rivet-punching machinery was building the skyline up and up. Discover a louder, more roaring New York here.